Were Sumerian speakers elite late arrivals in Sumer? There’s a simplified version of this statement on the Wikipedia page called “Sumer”. The statement references only the online Encylopedia Britannica entry just mentioned. It’s an astonishing claim, showing a profound level of ignorance of what archaeology can and cannot tell you about prehistory. Certainly, there is a theory, put forward a number of years ago by a number of linguists, that more ancient languages than Sumerian had once existed in southern Mesopotamia. The theory goes that agricultural words from these languages subsequently became embedded in Sumerian. Much, but not all, of the evidence for this is now refuted. But what seems odd to me is the statement giving a very late date for when Sumerian speakers arrived in southern Mesopotamia. I’m sure this must be an old idea but I haven’t seen it before. It may simply be a misunderstanding of some statement about the earliest evidence for the Sumerian language being from the late fourth millennium BC. However, the following two points could easily be put forward in its partial defence. The general consensus amongst linguists is that Sumerian is a language isolate, meaning that there are no known ancient or modern languages related to it. As such it can’t be shown where, geographically, the language might have evolved. When writing first appeared at Uruk-Warka during the Late Uruk Period, around 3300-3200BC, words were written in such a pictorial way as to give no guidance on how to pronounce them. However, by the Jemdet Nasr Period, around 3000BC, grammatical and phonetic elements started to appear which make it clear that the language being written was definitely Sumerian. Evidence of an unrelated Semitic language, perhaps Akkadian, is also present from this time in people’s names and in unusual words. By the middle of the third millennium BC, just a few hundred years later, Semitic languages were becoming dominant in the area, and it appears that Sumerian as a spoken language was on its way out. After around 2000BC Sumerian was moribund, used only for liturgical and literary use, a bit like Latin has become for us. The general explanation for this has been that Akkadian, perhaps nomadic, immigrants from the North poured into the southern cities from the Uruk Period onward. These swamped the population, changing the dominant language. Akkadian indeed contains quite a few Sumerian loanwords. However, Akkadian lacks the mass of Sumerian loanwords that one would expect if its speakers were technologically inferior to Sumerians. To Piotr Michalowski it appears that, if anything, the boot is on the other foot; A high proportion of Semitic loanwords in Sumerian suggests that Semitic was the technologically superior language. Michalowski also adds another possibility – that the Semitic language spoken in southern Mesopotamia was not Akkadian at all. If so, this would be problematic for the theory of incoming northerners. A couple of modern analogies might be helpful here. You could perhaps compare the rise of Semitic over Sumerian to the rise of Spanish in the English-speaking USA. However, Spanish has a long way to go in coming to dominate the US. Spanish is the language of an underclass in the cities of the southern US. The vast majority of the population of the US are showing no signs of taking up Spanish, and many Spaniards are becoming bilingual in English. Another, perhaps more useful, analogy could be of the Manchu language in China. Manchu is a Tungusic language unrelated to Chinese. Manchus took over China and formed the Qing Dynasty in the seventeenth century. For about two hundred years Manchu was the elite language of Chinese royalty and Chinese administration. Because Manchu people represented only a minority of the Chinese population, the Manchu administration made laws to keep their identity and genetic inheritance separate from the Chinese. Yet the language sank in the face of Chinese in less than two hundred years. Again there is much to criticise in this second analogy. Chinese already had a written history and an administration extending back several thousand years. Overcoming that would be a vast challenge for the Manchu. But, to return to Mesopotamia, if Sumerian speakers were the ones who had a written language first that should only have given them the advantage, an advantage that they still lost. The Sumerian elite called themselves “ung sang gig-ga”, or the “black headed people”. An Afrocentricist might argue this must mean that they were black but, to be honest, anyone apart from most north and west Europeans could make a good claim to being black-headed, in the sense of having dark hair. And when it comes to hair, those of you who have seen cylinder seals of the Middle Uruk period will be aware that the majority of men in Sumer and the surrounding area are drawn without hair. 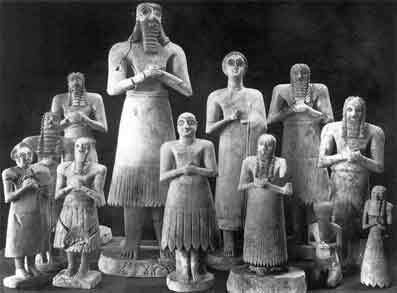 In fact many Early Dynastic votive sculptures seem to show bald men. However, some of the seals of the Late Uruk period also show rare men with beards and hair. These are often more heavily clothed and they often hold weapons. They are also often drawn at a slightly larger size, indicating their high status. In Early dynastic times, votive sculptures of this hairy type sometimes show the remains of black paint on their beards. By the end of the Early Dynastic period the fashion seems to be more mixed, with bald hair and beards on the same individual. Perhaps this is to be expected. But initially, these bearded men appear to represent a different, and higher caste. Were these the “black-headed people”? Discussion – the Sumerian elite? Kingship in Uruk-Warka emerged no later than the end of the Uruk period, or LC5, around 3200BC, judging by the “Titles and Professions List”. However, academics have speculated about how far back kingship might go. Clearly, from middle Uruk times there is evidence of some kind of authority in Sumerian cities. This is again shown by the presence of apparently organised workforces on cylinder seals. But is it possible that during the Late Uruk Period a foreign, warlike, Sumerian speaking elite imposed itself on southern Mesopotamian and Khusistani cities such as Susa and Uruk-Warka? Such an elite could have introduced to the southern cities new styles of dress, of hair, perhaps an interest in hunting and warfare… and its language. This needn’t be a significant number of people. Uruk-Warka, perhaps the most organised and sophisticated city in the world at this time, could have absorbed them into its Semitic-speaking population (smaller Susa probably could have too). But they might have left a lasting impression in terms of kingship, fashion and writing. The cumbersome use of Sumerian-based cuneiform to write Semitic languages such as Babylonian and Akkadian is a very good example of this. If such an elite did take over, one could endlessly speculate about their origins. Evidence for conflict appears as early as the beginning of the fourth millennium BC to the north, in places such as Tell Brak, Syria and Tepe Gawra, in northern Iraq, as well as to the east in Khusistan. However these could be red herrings. Frankly your guess is as good as mine… but I’d probably discount England. Crawford, H. 2004 Sumer and the Sumerians (second edition), Cambridge, pp252. Nissen, H. J. Cultural and Political Networks in the Ancient Near East during the Fourth and Third Millennia BC, In: Uruk, Mesopotamia & Its Neighbours (Rothman, M.S. ed. ), p149-179. Ostler, N. 2005 Empires of the Word: A Language History of the World, Harper, pp615. Pittman, H. 2001 Mesopotamian Intraregional Relations Reflected through Glyptic Evidence in the Late Chalcolithic 1-5 Periods, In: Uruk, Mesopotamia & Its Neighbours (Rothman, M.S. ed. ), p403-443. Source of cylinder seal information and pictures. Kitchen, A., Ehret, C., Assefa, S. & Mulligan, C.J. 2009 Bayesian phylogenetic analysis of Semitic languages identifies an Early Bronze Age origin of Semitic in the Near East, Proceedings of the Royal Society B 276, p2703-2710. This paper puts a date for separation of Semitic languages around 3800BC, which is, frankly, too late to support the above story (it would suggest a date more around the mid 6th millennium BC). However, see the comments of Piotr Michaeowski on the complex relations of Akkadian to ‘Sumerian-Semitic’ in his paper, an argument that may indicate an earlier separation date. Nissen, H.J. 1986 The Archaic Texts from Uruk, World Archaeology 17, p317-334. Now partially outdated due to availability of new texts and work currently being done in Berlin. Potts, D. T. 1997 Mesopotamian civilization: the material foundations, Cornell, pp340. Discusses early views on the Sumerian origins problem, including the idea of Proto-Euphrateans. So very much history and so little time to unravel it! So if the Kings List indicates that the deluge occurred around 10,300 BC and the Ubaidians were doing their thing starting around 5,000 BC, were there sources out there telling about the period from about 10,300 BC to about 5,000 BC or was that evidence made up of small cultures here and there that finally formed the Ubaidians? That then begs the question about the period from about 10,300 BC to the earliest King on the list, at about 425,000 BC. My answer (not really an answer) is not going to be very helpful I’m afraid, as I don’t really know. There’s a wonderful list in Genesis which lists father and grandfathers with improbable age lengths. I suspect that the past was always considered more godly and the ancestors had lives of more godly length. Sometimes reading these things feels like listening to boasty children saying their dads can lift four cars, which is more than your dad can. As each king of each city was vying for more godly status, they’d all tend to life-expectancy inflation for their ancestors.That makes the numbers given for ancient times unusable. Maybe you believe the dates and in the existence of one great deluge. I don’t. The other thing is that such myths tend to gain traction when people have a very poor memory of the past, often due to some crisis. For a nice cinematic comparison think ‘Planet of the Apes’. The strongest myths are forged in such times of crisis (think King Arthur, The Iliad, Beowulf, Moses). Each myth has a tiny grain of history sunk in a blancmange of fantasy. In my opinion this is probably true for ancient Iraq in what’s known as the Early Dynastic Period, which I suspect to be the nadir of a population collapse in the region. I think that this was the great period of myth generation for Iraq. Iraq has no history before this. And the Ubaidians? Well, they themselves are a modern label for people who made a certain kind of pottery somewhere in this prehistoric period. Were any of them called Dumuzi(d)? Maybe. So personally, I think that the whole king list before around 2300 BC is useful only in telling you what people of 2300 BC thought about the past, not about the actual past. Sorry if this sounds a bit negative. I think it only makes the 3rd millennium more interesting. funny how you placed youre opinion, then list at the bottom youre resources. youre resources says nothing bout black haired people, but they say black headed people… actually it says land of the black headed people and round that same time egypt called themselves kmt which means land of the blacks, while king solomon in isreal said we are black and comely. comely means attractive. The references list is just copying what they do in academic papers. However, if I were to write my posts like academic papers I’d have put numbers or names and dates in the text referring to the reference list. I guess it’s just laziness on my part. As for the other stuff I wrote this post some years ago, and I suppose that we just have to wait for the ancient DNA evidence to tell us of the people who lived in Mesopotamia back then. I think It’ll come soon to delight or surprise us. Either way, the ancient peoples of Mesopotamia, the Levant and Egypt are nothing to do with me. I just like understanding the world of the past. However, that world seems pretty brutal and macho and I prefer to live in the world (anywhere, except maybe Syria) now rather than then. If the Ubaidan civilization predates Sumer, why are we told that Sumeria is the world’s first civilization? Just curious. ‘Sumer’ refers to the name the later Akkadians gave to the area occupied by this ‘first civilisation’. As such it’s reasonable to call the first civilisation Sumerian, whether the people of that civilisation called themselves Sumerian or not (which they probably didn’t). Sumerian is now also the name given by modern linguists to the language used in writing by the people of southern Mesopotamia during the third millennium BC, which is also the earliest recorded language. Ubaidian is a modern name invented by Archaeologists, based on the archaeological site of Al Ubaid. This is the type site (i.e. a representative site) for a culture that archaeologists refer to as Ubaid or Ubaidian culture that existed between about 6000 and 4300 BC. Some linguists have chosen to see an ‘Ubaidian’ language, represented by certain geographical place names and other words that survived into history which cannot be either Sumerian. However, that language doesn’t necessarily have anything to do with the Ubaidian culture. Last point: culture means a set of shared artefacts which makes it look like a people have something in common. Ubaidian culture is generally recognised by its shared pottery. This is seen over an extensive area of Mesopotamia. However, cultures don’t have to be as complex as civilisations. So, there was no civilisation during Ubaidian times. The first civilisation (i.e. complex culture) only appeared during Uruk times (about 4300 to 3100 BC). If you want to call that Urukian civilisation, then thats a fair argument. They said they were “black headed people”, not black haired people. & Perhaps even the Beakers . .
Hi Ned, such an interesting article, I am struck by an analogy closer to home; the Normans spoke French, and ruled a country that did not, and despite the political dominance of this elite, their language was not adopted by the population. A lot of this comes back to the idea of political elites often being external to populations they exploit. The neolithic revolution and the growth of cities, can be viewed as elites organizing populations to work to produce the agricultural surplus, through which they are controlled. Peoples can be moved and redeployed for the benefit of the controlling elite, [as in the Bible]. In my somewhat cynical view, ‘Civilization’ is the product of an elites ability to manipulate the labour resources under their control, using warfare to increase the pool of people at their disposal. In this respect, Mesopotamian civilization, like most others, is a triumph of social control, rather than a technical advance. Funny you should say all this. I’ve been asked to give a talk locally on the origins of civilisation and, despite my preference for freeform evolution, I’ve come to much the same conclusion as you. I think there might be two aspects to civilization: firstly the ability of a monopolising trade cartel to ‘pay’ for lower status help to do their dirty work; secondly parasitical elites coming in to effect tax or corvee protection rackets on the whole system. There may not be a perfect analogy for this in terms of English history though, for although Normans clearly fall into the second category so do the Saxon Earls. Next post: Norte Chico and a Late Preceramic Peruvian native silver trade?